Cleansing foam for the face with an extract of snail and pearl powder, very carefully and efficiently removes dirt and toxins from the face of accumulated per day. Surprisingly soft texture, give pleasure from the application of the foam. You do not feel any sense of tightness of the skin after washing. Apart from the fact that the foam gently cleanse the skin, it also helps to maintain the skin in good condition, because it contains in its composition of snail extract, which promotes skin rejuvenation. 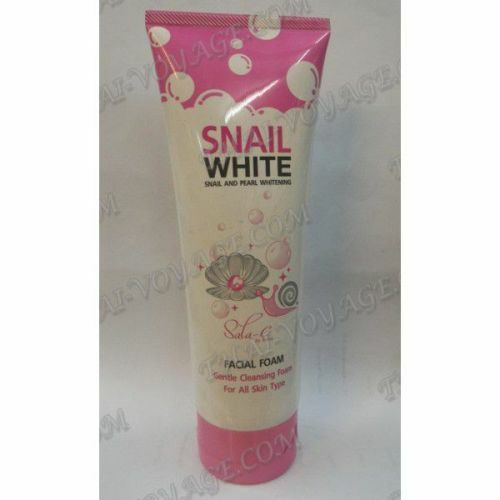 Snail extract effectively smooths wrinkles, nourishes and moisturizes the skin. Pearl extract, which is contained in the foams, also plays an important role in cleaning and caring for the skin. Pearl powder contains in its composition of calcium, and a huge amount of vitamins and minerals, which in turn help to strengthen the facial muscles. Another pearl powder has a bleaching effect and prevents the formation of age spots, lightens freckles, eliminates redness and irritation. Regular use improves skin complexion and makes the skin soft and velvety. Application: squeeze a small amount of foam on the palm and lather, and then in a circular massage movements put on the face and massage. After a rinse with warm water. Recommended to use morning and evening.